← 15 weeks to go – its getting intense! For electrolyte replenishment, I only used gels and sports drinks for my first marathon. I tried several different types and discovered that caffeine and I don’t mix while running – it left me scrambling for more energy as it wore off and often times I would nap for 3-4 hours afterward. No bueno. I also found that flavors such as chocolate, latte and vanilla upset my stomach. I needed something tart and tangy. Ultimately, I found eGel by Crank Sports online. This stuff boasts 1.5X the amount of calories, sodium and potassium without any caffeine. Great! I order the trial pack and fall in love with the cherry bomb and mountain rush flavors (think sour cherry and mountain dew flavored gel). Throughout my training, I was very loyal to my eGel. It got me though training runs, half marathons and even the LA Marathon. 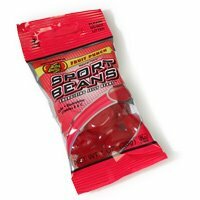 While training though, I was introduced to something called a Sport Bean made by the good ole’ Jelly Belly people. “How the heck are jelly beans going to keep me from glycogen depletion and give me adequate electrolytes and energy to run this thing?” I thought. I quickly turned away and didn’t even give them a shot. Fast forward to training for Long Beach, I forget to bring my eGel on a long run and decide to purchase some sports beans instead. I bought the fruit punch flavor, loaded them into my race ready short, and took off for my jaunt in the heat. Let me tell you, these things taste AMAZING, go down much easier than gel, gave provided me with energy boosts, weigh less than gel packets, and well I’m pretty much a believer in the Sports Beans now. I have used them now for two long training runs, both of which were in some pretty hot/humid weather and the beans worked wonders. The beans have earned a permanent place in the pocket of my shorts. This entry was posted in Product Reviews, Running Gear. Bookmark the permalink.